Ebay argos click and collect ~ what to do ? Sold an item on ebay , buyer opt for argos click and collect. Gave me the argos address and a code. What do i do ? take my item to my local argos store or post it directly to the given argos address? your buyer’s chosen Argos store as well as a 6-digit unique identifier code in the second line. This is so Argos can identify your parcel and notify your buyer, so make sure you don't remove this code from the address. 1. When an order comes in, create your postage label as usual, addressed to your buyers’ chosen Argos store. If you hand-write labels or use custom integration, make sure you include the unique identifier codein the second line of the address. 2. Send the item using the eligible service and carriers you specified in your listing and mark the item as dispatched in My eBay. 3. Once your buyer’s order is ready for collection at Argos, we’ll send them an email and text message with a collection code to bring to the store. i bought from ebay and opted for click and collect at an argos store. really convenient. a lot of ebay sellers are doing this now. it is better than sending something to someone's home as the buyer can't claim the package did not arrive. i bought from ebay and opted for click and collect at an argos store. … i bought from ebay and opted for click and collect at an argos store. really convenient.a lot of ebay sellers are doing this now. it is better than sending something to someone's home as the buyer can't claim the package did not arrive. I tried to click and collect an item from Argos's own eBay account at ten to 5 on a Sunday. big mistake!!!! I tried to click and collect an item from Argos's own eBay account at ten … I tried to click and collect an item from Argos's own eBay account at ten to 5 on a Sunday. big mistake!!!! Why big mistake ? .... system crashed ? ....didn't receive item ? Sold an item on ebay , buyer opt for argos click and collect. Gave … Sold an item on ebay , buyer opt for argos click and collect. Gave me the argos address and a code.What do i do ? 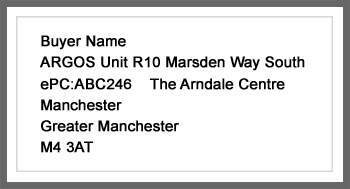 take my item to my local argos store or post it directly to the given argos address?Thanks for any reply. It is not safe, if you send a parcel through click and collect and the customer comes to collect the staff need to process it with the (ecp) code, if they just 'hand' over the parcel without using the code, the customer can pretend they haven't had it as in the stores systems it will say 'in store' eventually it'll expire and the seller will have to issue a refund as the seller 'hasn't got it' hence it wasn't processed properly when handed to the customer but the customer has it? Resulting you losing the parcel and the full amount of the money refunding the person and the buyer is happy with a free item.